If you demand the highest quality, the greatest value, and the most durability, you'll find yourself turning to this incredible pole tent from Ohenry tents. With its large size, stability in adverse weather conditions is usually a concern, but this tent can handle whatever the weather throws its way with wind ratings up to 70 MPH in certain conditions. This kind of durability occurs because of the quality materials and construction used. With poles made of heavy-gauge steel, plate-welded construction, and sturdy pin connections, stability is a given. The canopy itself is strong enough to protect from rain, intense sun, and wind with its 15 oz laminated vinyl and 2" seat belt banding. 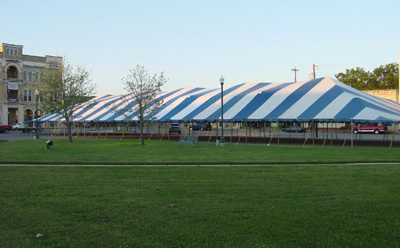 Whether you host events or rent tents, this tent will withstand multiple setups and take downs without showing wear.